It's funny how I have been using Photoshop for five or six years, and I think I'm pretty good with it, and yet there are some parts of the program that still elude me. Some of the features still seem quite complex, and so I just kind of forget about them and end up ignoring them. Not realizing what it is that I'm missing out on. So too it was with the Pen Tool. But no more I say! I was looking at a Minitokyo affiliate site called Imanimetions, and noticed that they have an excellent tutorial section which just happened to contain a great little Pen Tool tutorial. Finally, this tool was no longer a mystery to me. This tutorial presents the Pen Tool in a straightforward manner and teaches you how to use it effectively in no time. Armed with this new knowledge, I was able to begin doing vectors—the oh so popular way to render images, especially in anime/manga. I figured I would start off doing my first vector piece with something simple. 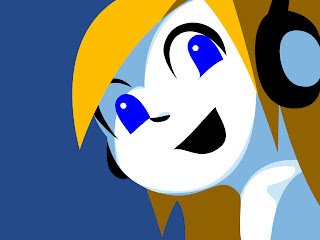 A perfect subject for my experiment would be a little character portrait of Curly Brace from Cave Story, a.k.a. Doukutsu Monogatari. I love this little image and have been meaning to do something with it for a long time. I didn't take me all that long, and I put it up on Minitokyo after I finished. I have also made the wall available above (just click on the image for full view). Hope you like Curly as much as I do. Eventually I'll do some more complex vectors now that I have a handle on it. Until then, enjoy Curly Brace, and go get yourself Cave Story to experience the awesomeness that it is!